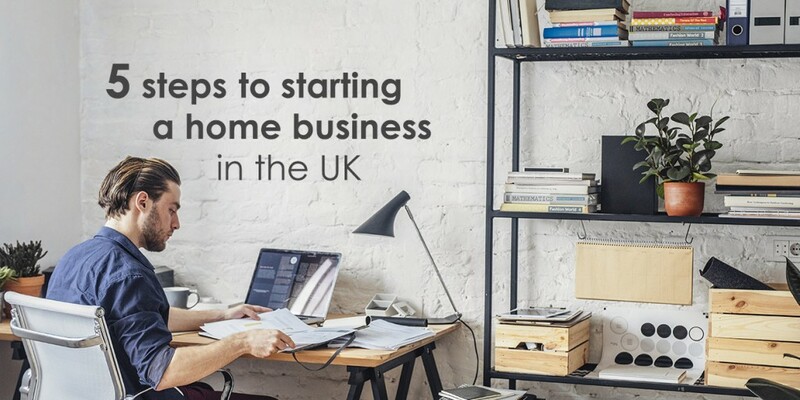 Whether your ambition is to launch the next Amazon or you simply want to make a good living from your kitchen table, there’s never been a better time for starting a home business in the UK. Considering the rise of online marketplaces like eBay and Etsy, increased availability of low-budget digital marketing channels like web search and Facebook, and enhanced opportunity to communicate with customers by phone and online, the opportunities are rife. To get you started on the road to home-grown business success, let’s walk through the five key steps to getting your home-grown enterprise off the ground. Choosing the right business setup from the outset could save you a considerable amount of time and money in the long run. This option is ideal for simple, small-scale home businesses where most day-to-day work is done by the business owner. The first step to setting up as a sole trader is registering as self-employed with HMRC. You’ll then need to file an annual tax return, covering your annual takings and expense. Provided you keep a full and detailed record of your finances, processing your return should be relatively simple. Multiple sole traders, trading together as a single entity. Partnerships are ideal for leadership teams who prefer not to go through the process of forming a limited company. In a partnership, you’ll share responsibility for accounting and business finances with your partners. A limited company is an independent entity, registered with Companies House as a legal “person”, separate from its owner(s). Setting up in this way involves a relatively large amount of effort and investment. In return, limited company directors enjoy benefits such as exclusive naming rights, tax advantages, and improved opportunity to secure business loans and investment. For detailed guidance on setting up as a sole trader, partnership or limited company, visit Gov.uk. How will you tell people about what you do, and how will you keep customers coming back for more? Some home businesses create marketing plans just as in-depth as far larger competitors; others are very minimal and instinctively formed. •	Social media. Facebook, Twitter, LinkedIn, Snapchat and Instagram all offer unique ways for small business to reach customers or clients. •	Website. Whether you commission an IT company to make one for you, or you create your own using a service like Wix.com or WordPress, a website can act as a valuable shop window for home businesses which don’t have bricks-and-mortar premises for customers to visit. •	Paid search marketing. Advertising via Google and other search engines can help build traffic to your website quickly. •	Print advertising in local newspapers. This option works well for some local businesses. You can learn how to track youf offline advertising with this helpful guide. Once you’ve identified suitable ways to market your business, allocate time and budget to the appropriate marketing methods in a marketing plan. This strategy should be open to ongoing change, so you can make tweaks and try new things as you go, based on which tactics seem to be working best. If you are new to marketing, we recommend checking out the Chartered Institute of Marketing’s guide to the 7 P’s of Marketing. It’ll give you a good grounding in the theory behind how to bridge the gap between product and customer. Research from the Royal Mail indicates 58% of SMEs that sell online now use online marketplaces like eBay, Etsy and Amazon to sell their wares. Signing up to an online marketplace can provide rapid access to relevant consumers. Look into which online marketplaces are being used by similar businesses to your own, then sign up to the most suitable platform. How well a business communicates via telephone and online can impact brand reputation, customer loyalty and the rate of conversion from enquiries into sales. It pays to get this right from Day 1. •	0800 numbers – freephone numbers, ideal for encouraging telephone enquiries. •	0333 numbers – landline-rate national numbers, to drive home the message that the business is a nationwide concern. •	Local numbers – for creating a “local” presence outside of the business’ geographical location. Any of these three options will indicate professionalism, unlike using a personal mobile or home phone number. Tamar Telecommunications can set you up with a business telephone number in 1 working day, choose your number here. The other side to nailing customer communication is mastering your online channels. This involves setting up a branded email contact (e.g. via Gmail ), and diligently manning other online messaging channels, especially if you have a Facebook business page or online marketplace account. Four-in-ten small businesses in the UK fold within five years of launching. To minimise the chance of your home business becoming a part of that statistic, you should cultivate a strong support network to help you on your journey. The above examples, taken solely from Facebook, should give you a sense of the diverse range of business communities existing on social media. Another element of your support network will be friends, family and other personal connections. There’s a fine balance to be struck in terms of how much help to expect from the people you know. We suggest you ask them for advice and contacts, rather than services. Close friends and family may also be willing to help with more hands-on tasks in the early stages of start-up. Trade bodies and unions can also be a huge asset to a home business’ support network. Consider signing up to the Federation of Small Businesses, plus any groups relating to your industry. Here’s a list of industry organisations and trade associations in the UK , from the Acupuncture Association of Chartered Physiotherapists to the Yacht Brokers, Designers and Surveyors Association. Almost every industry has a network and collective knowledge base to tap into.